There are a number of men who are not named on this memorial, for whatever reason. Where my research has revealed details of men with a Blewbury connection then I have detailed them as best I can only if they have a Great War history. L/Cpl Edward George Thomas ?– Joined the Royal Berkshire Regiment as No. 7661 aged 18 on March 28th 1904 and listed his birthplace as Blewbury. He was the son of Frederick and Rose who moved to Marcham at some point, Roses family being from there. He was promoted to Lance Corporal quite quickly into his military career on August 3rd 1906. He would probably have signed up for a total of fourteen years with seven being served and seven in reserve but on Feb 26th 1912 he was struck off the strength of the reserve after failing to attend two successive quarterly signings. He obviously gave a good reason for non-attendance as he was re-appointed on May 2nd of the same year. Not learning from his experience he did it again and was struck off again until he decided to turn up and was taken back on strength on March 6th 1914. Of course, war was soon declared and all troops on the strength would have been mobilized, L/Cpl Thomas was summoned on August 5th 1914 but he failed to report. He was charged with desertion yet to make amends he re-joined on December 10th 1914, obviously under some extreme pressure to do so. He would certainly have been charged. He immediately declared himself sick. He had been in Hospital in Dublin in 1904 for one month with congestion of the lungs and now stated that he had contracted Diptheria whilst in Canada in December 1909 and was deaf. He was given the standard test of the time for deafness. A pocket watch was held at varying distances from each ear and he had to state when he could hear the ticking. Two feet distance from each ear was the acceptable level and Edward said he could hear it only six inches away from one ear and a very worrying three inches from the other. On this basis he was discharged from the army on December 23rd 1914 and given a certificate to say he was exempt from military service to show anyone who required it. Pvt A E Gunn – Originally No 14883 in the 17th Lancashire Fusiliers before transferring to the 187th Labour Company as 111880, Private Gunn was married to Sarah A Gunn who gave her address as South Street, Blewbury. He contracted Pneumonia and as a consequence died on November 16th 1918 aged 37. He was the son of Joseph & Mary West of Nuneaton, I am not sure why they have a different surname to him and I leave the speculation to the reader. He is buried at St Sever cemetery in France and is not named on Blewbury or the Nuneaton memorials. Rowland Butler – Born in Blewbury, died Salonika 8/5/1917. He enlisted in Cholsey, 11th WORCESTERS 17140. Pvt Phillip Skerry – Born in Blewbury, Phillip requested that he serve into the Royal West Kent regiment when he enlisted on September 15th 1914. He wanted to enlist for three years, this was acceptable at the time as it was only later that soldiers were enlisted `For the duration of the war’. or DOW as it is written on service papers under length of service. His enlistment papers, signed when he was 22 years and 8 months old, show that he had difficulty in writing. His service papers are a little vague. They show he was posted to Tipperary in Ireland on January 19th 1917 and then was transferred to the Labour corp. Serving in 729 company as 384695 he may have gone absent without leave as the army office wrote to his father James in early 1919 asking him if he knew of his sons whereabouts as they wished to demobilize him. They also wrote to the unit they believed he was serving with which was still in France at the time. Some contact was made as Phillip submitted a letter stating he had signed up for three years only and not the duration of the war, of course the army disagreed when they replied on February 6th 1919. They were kind enough to officially discharge him on May 13th 1919 anyway. John Rennison – Jack, as he was known, married Gwendoline Doris May Green, sister of Monty Green (see volume 1) on December 18th 1915 at Wantage Registry office. At the time he was a racehorse trainer living in Blewbury but born in Wolverhampton. He had previously served in the army and was called up to the RASC remounts as number 362477, aged 38 years and 6 months on September 5th 1917 and had just had a baby girl born April 29th 1917. He was probably a jockey at some point, standing 5 feet 5 inches tall, he must have immediately put in for his discharge papers as his services were no longer required due to the fact he was not physically fit on February 19th 1918. He had bent fingers which he could not straighten, he had had these prior to being called up and must have been surprised that his services were asked for. There is a strong chance he never actually left for war but remained at home whilst his claim was being validated. He passed away about 1956. In August of 2008, when we were completing the research into the backgrounds of the brave men of Blewbury listed on the village’s war memorials, I asked Isobel Street if the 16th century coffer in the parish church of St Micheal’s might contain any records of the war memorial committee. That request led to the creation of this work. At a Parish meeting held in the village at the National School room on June 4th 1917 an anonymous donor repeated their offer to erect a War Shrine here,`in honour to our own village lads who are fighting and dieing (sic) for us in this terrible war that is still raging’. So the first village memorial was created whilst the hostilities were occurring. It was erected very soon after and adopted as Parish property on November 13th 1917. The inscriptions at this time would have had to be temporary, perhaps even just paper and ink, and it was only in July 1919 that the clerk of the council, Jesse Dunsden, was appointed to have these properly inscribed. From early 1919 there were outpourings in newspapers for memorials to be erected in recognition of those who had sacrificed their lives in the Great War, for the nearly one million men to be remembered in the villages and towns in which they had lived before the turbulence of Europe’s politics impacted on them. Memorial committees were established to act as gatherers of information so that names could be set in stone, wood and on paper to stand as a Debt of Honour from those who remained. Usually, as the age dictated, they were church based and the members of the committee were drawn from those who were involved in the day to day activities of the village such as Postmaster, vicar or shopkeeper. There are many memorials that list alongside those who died those who also served but for the purpose of clarity then my reference to a memorial shall be deemed to be one that only carried the names of men who fell. The major point to note is that few memorials were raised until the 1920’s and the majority from the end of 1921 onwards. One of the major factors for this, besides the requirements to raise funds and erect the structure, was the number of wounded men still in hospital after the war. If they died of their wounds then they were judged as much a victim of the war as the man who lost his life on the battlefield. The Government had to decide on a date for which death afterwards could not qualify as war related. They fixed this for August 31st 1921, nearly 3 years after the armistice. Therefore if a serving or previously served man died between August 4th 1914 and August 31st 1921 of war related injuries, then he would be granted a Commonwealth War Graves Headstone. Local committees could, at their decision, place a man’s name on a local memorial at any time if they thought his death was related to the war and one can imagine the issues that arose over that power. All men who died in service during the hostilities (August 4th 1914 to November 11th 1918), regardless of cause, were automatically granted a memorial in some form by the CWGC. Note I say ‘man’. No woman is named as having died in service on a war memorial in Britain, VAD nurses did die during the war but it was decided, by someone in authority and likely representative of the times, that they were not to be included, despite women’s rights and the suffragettes being very much in the ascendancy at this point in history. So why might a name not be included? There are many simple reasons. His next of kin and all family may have moved away after his death and not asked for inclusion, relatives did not want to be involved in the process and thought has always been given to local politics playing a part. Or the committee refused the application, no reason was required to be given. Only military personnel were to be considered, civilians were not included even if killed by direct enemy actions such as Zeppelin raids or naval shelling. More sadly, some relatives did not believe the soldier had truly died and yet might still return so did not want them listed. There is genuine proof that men were listed as missing for years sometimes and then turned up in a POW camp or hospital. But, at the end of the day, inclusion really was a local decision. Further on in the book you will see the names of men killed in the war who were born in Blewbury yet not commemorated on our memorials to further emphasise this although we have no way of knowing why the decision was made thus. Generally, historians are lucky in that there were notes made at the time as to committee’s decisions and these are saved in a special minutes book. Aston Tirrold’s exists in the county archives as do many others. But where were Blewbury’s? As Church warden I hoped Isobel might have access to the coffer and the minutes book might be in there. It was worth asking and I was not expecting what happened when I did. One evening Isobel called and said 'I have found something on the top of a cupboard in the church that I think may interest you'. When she came around that night with the item that is at the base of these pages. I was, for a moment, overcome with a great sadness. This list of one hundred and forty-four names was from a village which contained around only around 250 men at the time it was written? How empty it must have been of working age men over those four years. I soon realised what a fantastic piece of history we had available to us, there are few memorials that give testament to everyone within a location who answered the call to duty and possibly returned. There are more frequent memorials to those within a company or works who answered the call of duty in a similar vein which show all names of serving and killed men. Of course, I was later to learn that not all those listed originated from Blewbury or even lived within the village. The biggest question has to be `Who wrote the list and how did they compile it?’. Derek Smith said he recognised the writing as possibly that of Harold Dunsden and this would certainly align with the fact that Jesse Dunsden had been given the task of stewardship of the original war shrine. I also have a theory that the document MAY have some connection with the war shrine. When it was originally conceived then it would have needed to be a list that could be added to. When the armistice in November 1918 came then the list could be finalised. The title reads `List of Blewbury men who have responded to the call of King and Country’ implying that is was written in the present tense with the implication that the war was still being fought. But as the title card is of a separate construction to the list then was the title card used in the original war shrine and the list shown used at the location from November 1918 until July 1919 when a more permanent means of inscription was ordered?. Certainly the research revealed men whose names could only have been added to the list in 1918. It’s a theory which the passage of time may refuse to let us confirm though. I have listed the men in the order they are shown on the memorial, although not strictly alphabetical. The rank shown is that which is recorded on the man’s medal card, his rank at the end of his service and usually the highest he achieved before his service came to an end. My search of records has been far and very, very wide and has also included verbal recollections from those who knew the men when they returned form the wars, if they did. When searching using computerised records then occasionally I have come across spelling errors in the mens name or certainly differences from that recorded on the memorial. When you consider the fact that many of the records of service and pensions were burned or damaged in the blitz, only really being salvaged in the past 15 years then this is perhaps excusable as the volunteers who copied them onto computer are only human. I have not used embellishment nor supposition, just the facts as they are written or have been told. The stories do not recognise the individual bravery of the men but they are testament to service and duty amongst many things. They give an insight into the social history of a period of which there are is no-one around today who can tell you what life was like in a Downland village during the Great War and even more so what happened to its occupants. Sgt Ernest (John) Aldworth – Born in Blewbury in July 1880, the son of Thomas and Louise. 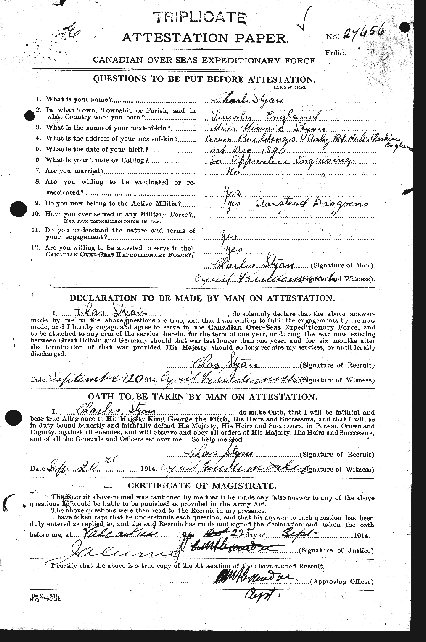 Ernest’s service & pension records survive and they reveal he served in the Army Service Corp, No R14095, originally enlisting on 11th August 1898 when he was a labourer on William Saunders farm. With an uncle serving in the 17th Hussars he was taken on as a driver, obviously experienced with horses. After a year of training and with the Boer war starting he was shipped out to Natal province in South Africa on 8th July 1899 and stayed there for over three years, returning home on 10th September 1902. He accepted a war pension and should have still been a reservist and returned to work in Blewbury. However, he then re-enlisted in 1910 as a reservist, certain obligations were required to be met to still be recognised as a reservist and it is unclear if he had kept to them as he re-enlisted into the reserve again on the 16th July 1914. No doubt as a result of the news coming from Europe. It may be that his term of service merely expired each time but this is not revealed. His record shows he was living at home, but under Army rules, until his call up came on 26th August and he shipped out to France. He had an uneventful war, as regards his service records, until he returned home on 2nd February 1918. Still serving this may have been special leave or perhaps a course although the records do not say. He didn’t stay long as he returned to France on 18th Feb. He saw through to the armistice and then met with a nasty accident at 7:30 on 20th December 1918. His account of this exists and is shown below. It explains that he was trying to catch a loose horse when another horse, ridden by a colleague, kicked him and broke both the fibula & tibia of his right leg below the knee. He was taken to hospital in Rouen and returned home on the 29th December, no doubt in a lot of pain. He still had to complete a report to show his injury was not self inflicted, this was accepted and he was discharged as physically unfit for further duty after 20 years and 310 days service as an acting Sargeant. Gunner William Henry Aldworth – The brother of the above soldier, born in Blewbury on 4th April 1885. William’s service records show he joined the 3rd Battalion Royal Berkshire Regiment No 6506, aged fifteen, in 1900. No doubt as his brother was in South Africa and as a result of the call to arms. He was in the employ of E Caldwell at the time and very quickly moved over to be a driver in the Royal Horse Artillery where he served in the UK from 21st August 1901 until 5th August 1904 when he reached the age at which he could be posted overseas. He went to India for five years, not leaving until 6th November 1909. He then did home service and signed up to the reserve and was called up when war was declared. During the war he was No 18519 in D battery, Royal Horse Artillery. He went to France on 5th November 1914, serving also in Belgium, and returned home on 30th December 1918. After the war he moved to Maida Vale where he worked on the railways, his pension records mention a son born in 1919 in Maida Vale. Sgt Charles Edward Aldworth – Blewbury born in 1889, his service records reveal he enlisted as 9026 in the 2nd Battalion Royal Berkshire Regiment on 2nd November 1908. During the war he returned home and married Millicent Grocott in Blewbury on 14th July 1915 whilst still a soldier. He was invalided out the army during the war, reason unknown, yet re-enlisted under new army number 5328178 being finally discharged from service on 31st January 1930 after twenty-two years service. He passed away in 1953. CSM George (Ransome) Aldworth – George’s medal card was easy to find with such a distinctive middle name which he insisted on using. Born in the village on 9th April 1891 and served in the 2nd Battalion Royal Berkshire Regiment as No 9027. He entered France on 6th November 1914 and I suspect he was a reservist or a regular soldier as he entered as a Lance Corporal and in the Regular 2nd Battalion of the Royal Berks. His final promotion was to Warrant Officer Class 2, he had been wounded though and was finally discharged on February 9th 1919. He was one of the four brothers shown above and passed away in 1976 in the Reading area. 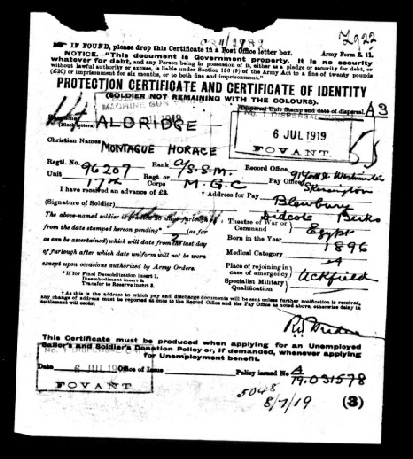 Private Ernest Alder – Ernest’s attestation papers have survived. They show his middle name as William (or first name depending how the papers were completed) born in September 1893. He enrolled on the 19th of March 1916 whilst being employed as a farm labourer and joined the 3/4th Royal Berks. He stood at 5 ft 5 inches with a 32 inch chest so he was not a big lad despite being 23 years of age. His next of kin was given as his mother, Mrs Ada Shorter, who was living in Ashbury near Shrivenham. This leads to the question of why he is named on the memorial. He gave his address as Westbrook Street and perhaps this explains it. It also leads to the assumption that his mother had remarried. He completed his basic training and then on 14th July 1916 he embarked for France with the Royal Berks. They landed at Rouen the next day, it was common to sail at night to avoid the U-Boats that patrolled the channel at night, and eight days later Ernest was in the trenches. There are no remarks on his service record, despite the fact he would have been in many actions, until the 5th Febuary 1917 when he was admitted into hospital for the day with a bad toe. Two months later, on the 16th April, he was admitted to Amiens hospital with a bad leg and at this time given a new army number of 201863. It was clear that Ernest had a few problems now though and on the 19th May he was re-admitted to hospital with a bad right leg. He was still there on the 31st May and then transferred to the South African general hospital in Abbeville the next day. On the 31st October he was returned to active service but with the armistice so close he must have had a quiet few days. He was sent back to Cherbourg and home on 19th February 1919 and returned to Blewbury. His discharge papers came through on 27th May 1919 but before this Ernest did something incredible. He had re-enlisted as No 148754 on his return to Britain in February knowing he would be up for discharge anyway. Despite all his illnesses whilst in France, and despite the fact that he had been distinctly unwell, he thought he wanted to see a little more action. The Army, being the Army, obliged him and before his discharge papers for his service in France arrived in Blewbury he was sent to Newcastle to join the Russian Relief Force which sailed for Archangel on 12th May 1919. He spent six months there before being posted somewhere for ten days which is unreadable but could be his journey home. Whatever his plans were after the Russian adventure then the army had some plans of their own. He did spend 145 days on home service before being put on a boat to India, Bombay infact, for 25 days before spending a further 125 days service in India. This takes us to September 1920, the war is long over and yet Ernest was still in for more travelling. The army posted him to Basra, in modern day Iraq, where he caught tonsillitis. He got a bad knee in Baghdad and rounded his his tour off with a short stay in Kut hospital with an abscess. Ernest had signed up for two years service which promptly ended on the 25th February 1921 in Basra. He returned to live in Nottingham Fee Cottage. Private Robert P Alder – Born 1893 in Compton, the son of Phillip and Annie (hence his middle name being Phillip). He enlisted early in the war on 7th September 1914 joining the Royal Berks as 8/13210. Assuming this to mean he was at some point transferred to the 8th Battalion which was established later in the war. Robert was a big chap for the time, a farm labourer measuring 5’ 9 ½ inches, weighing 129lbs and with a 36” chest and being only 21 then he was a good size of lad. Brown eyes and black hair must have made him quite a Heathcliffe type of figure. He was kept at Home Depot until he was trained fully, leaving for France in December 1915, quite a time. He was there until he received a wound in action, classed a gunshot but could have been shrapnel, on 1st June 1916 and came home 6 days later. He perhaps was seriously hurt, being 35 weeks away from duty, as he rejoined the 3rd Berks on 31st March 1917. He saw home service until 12th June when he was then posted to France again, this time with the 6th Battalion. He was only there two weeks before being sent back to the UK having been admitted to hospital in Rouen on the 15th June. He did not return to France and instead received a posting to the 457th Agricultural Company, no doubt being unfit for active service, on 27th March 1918. This may have been to Scotland as his record bears that information. His last army number, under the Labour Corp, was 545456 under 514 Ag Company and he was demobbed on 2nd April 1919 with 4 years and 207 days service to return to his address of Ashridge Cottage, Beedon Hill, Newbury. He did get a small pension with an advance of £2 on 5th March 1919 but you have to wonder if it made up for the inevitable effect on his work as a labourer. Squadron Sargeant Major Montague Aldridge – Enlisting as a soldier into the Berkshire yeomanry in Abingdon on 13th January 1914 then Monty Horace Aldridge had already decided he favoured the military life over staying in Blewbury. He was working for his father as a fruiter, his brothers were Walter and Eli Frank (see below). When he enlisted he was only aged 17 and stood 5 ft 7 inches but did not actually get his call up papers until 15th June 1914, its not possible to say exactly why but he may have decided to wait until he was actually 18 before joining. His medical papers say he stated his age as 19 which was clearly not true as his attestation papers say otherwise. He would have joined as a Trooper, learning horsemanship as a trade and he embarked with the rest of the Yeomanry to Egypt on 7th April 1915. The likelihood is that Monty Green (see Volume 1) was with him on the ship. Both men were sent to Gallopoli where they lost comrades in action before being returned to Egypt. Montague Aldridge was posted to the 2nd company and sent to Mena camp on Christmas Eve 1915 by which time Monty Green had been killed. 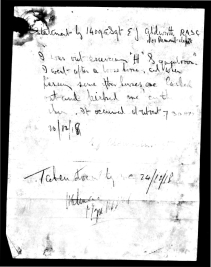 Montague decided that he would like to join the newly formed Machine Gun Corp and went on a course at Zeitoum on 13th October 1916 after which he transferred to the MGC Cavalry on 3rd April 1917 after qualifying as a first class machine gunner and being given the number 96207 in exchange for his 1844 from the Yeomanry. Able Seaman (Eli) Frank Aldridge – Born in Aston Tirrold on June 8th 1894, Eli (named as Frank on the memorial) was also a son of George and Sophia Dearlove. George was one of the watercress growers of Blewbury, listed in the commercial directory of 1915. Frank joined the Royal Navy as J8174 and started training at HMS Impregnable on April 19th 1910 when he was still only 15 yet stood 5 feet 6 ½ inches tall. His training was thorough and he served as a boy on a variety of training ships before his last spell on HMS Drake. On 9th June 1912 he was adjudged to have made the grade and was taken on as an Ordinary seaman to serve on Drake further. He had grown 1 ½ inches in this time and was far advanced from the occupation of garden boy who signed on in 1910. In 1913 he was sent for further land based training and returned to serve on HMS Racer, a screw powered sloop that was a converted sailship, until June 1914. When war was declared he was onboard HMS Hecla, another converted sailship rebuilt in 1912, acting as a Destroyer supply ship. He was transferred to HMS Garland at some point soon although his service record is not clear when. HMS Garland was a new Acasta class destroyer, being built in 1913, and had the honour of bearing the oldest confirmed recorded ship name in the Royal Navy. He left the Garland at an unreadable date sometime in 1916 though and spent until May 31st 1917 on a ship whose name I cannot decipher before spending two months from June 1st 1917 on Moon class destroyer HMS Peyton. Transferred to shore based duties now, towards the end of he war he spent time in Malta before returning to the UK and being invalided out of the service on February 26th 1919. It does not list a reason for this. He married a girl called Bessie King in 1926 in the Wallingford district, died Wokingham 1955. Stoker Walter W(illiam) Aldridge – Born in Blewbury on 18th February 1892, Walter was a farm labourer when he joined the Navy as K16194 on 11th September 1912.Aged 20 years he was 5ft 2 inches tall with brown hair and blue eyes with what is described as a fresh complexion. He was identifiable by scars on his right thumb and the third finger on his left hand. Prior to the war starting he served on HMS Hawke, then a depot ship, which was converted to an armoured cruiser and then sunk on 15th October 1914. He had been transferred to the light cruiser Liverpool a year prior as fortune would have it. Walter was serving on Blenheim, a depot destroyer, at the outbreak and went over to the Dardanelles campaign on her in March 1915. Whilst in this campaign a sister ship, HMS Wolverine (Beagle class destroyer) had a 1st class stoker killed on 27th August 1915 and Walters service record shows he was transferred to the Wolverine on 1st December 1915 for a period of six months. He sailed home on this ship so may have been a replacement for the lost man. He saw the war out on HMS Greenwich, another destroyer and remained with that ship until October 1919, still in service. After a brief spell on land at a training depot he was posted to HMS Dido for two months before returning back to the land training depot for nearly a year. On 7th July 1921 he was invalided out of Naval service with Organic Heart Disease and paid his war gratuity. He was granted as serving for twelve years according to his record. Robert Aldridge – I have only been able to locate one man of this name who served and has links to the village but I cannot be certain it is the correct one. Robert N Aldridge was born in 1899 and the brother of the previous three men. He would have been called up in 1917 and if so then I can trace a man of the exact same name in the Machine Gun Corp, Number 138100, and the number does correlate to someone who would be signing up in that period. He did serve overseas although his records do not exist. He married in 1926 in Wallingford district to a girl named Somerville and had an early death in Reading aged only 33 in 1933. Newman Aldridge – See Treading the path of Duty 1. Further service history not listed in Vol 1. Private Wilfred Aldridge – When Wilfred Bertie Grace Aldridge enlisted in Reading on the 27th November 1915 as 23956 in the Royal Berkshire Regiment he could not imagine the change it would have on his life. He was young, being 19 years and 6 months, and very slight of build. Typically he had to wait six months before his actual papers came through and on 18th May 1916 he reported to the 3rd Battalion in Reading. With his training completed he was sent as a draft replacement to the 7th battalion who were in Salonika. This picture of him was printed in an edition of Berkshire & The War after he was wounded. His wound was severe and he had to have the majority of his leg removed. He was now no longer fit for duty and so on 14th August 1918, granted SWB no. 434103, he was sent back to Blewbury to continue his life. He did so by becoming a carpenter from his house at Wheelwrights on London Road, making coffins as a sideline, and repairing many houses within the village . I have heard tales of him having no difficulties scaling ladders or climbing onto roofs, long before scaffolding and health and safety were required. He unveiled the Lychgate memorial to the fallen along with Jack Thatcher who had also lost a limb. Wilfred never married. His life in the village was full, he had Claude Upstone as a very good friend and they frequented the Load of Mischief, Wilf liked a lunchtime pint as a working man did. He died in 1967 aged 72 years old. Ernest Aldridge – I can trace two men from the village of this name who may qualify. Ernest George born Dec 1885, son of Tom & Pamela and Ernest John, born 1883 son of George & Sophia. I have not been able to trace specific military records for either men though. Frederick Aldridge – I think it likely that this man is another son of George & Sophia, with a middle name of George and born in 1881. However, I have not been able to identify his military records. He lived to the age of 83 before passing away in Wallingford. Despite all this information I had not been able to identify his military service. That is until a medal was discovered in the garden of the Old School House in the village in August 2011. It revealed that he served in the Royal Marine Light Infantry and was a pre-war enlisted man. He joined up on 16th October 1908 as PLY/14707, the PLY meaning he was Plymouth based. He had an eventful 12 years service. Prior to the war, from February 1911 to End of August 1913 he served on HMS Defence. This battleship escorted King George V on his tour to India in November 1911 and then went out to the Far East to serve in the China Seas fleet along with Tom. Whilst in the Far East, in Hong Kong, Tom switched ships and in March 1914 was put aboard a newly refurbished Gunboat HMS Thistle. From his whole service history I have the hunch that he was a gunner, perhaps on the machine guns that all ships had fitted. When war was imminent then he was transferred again whilst still in Hong Kong to HMS Triumph, a battleship which was held in reserve there. She was refitted for a period of four months until November 1914 and Tom stayed with her as she sailed over the Gallipoli campaign in the Dardenelles. Here the battleship took part in the action and on May 25th, around Midday, was torpedoed by U21. She took nearly one and a half hours to sink before turning turtle and going down. Seventy men drowned but 630, including Tom, were rescued by other ships in the harbour. Tom was passaged home before being posted immediately onto another gunboat HMS Dwarf. Although the experience of being torpedoed cannot have been pleasant it was significantly a better course than that of his previous ship HMS Defence. She was sunk with all hands at Jutland in 1916. Tom saw a long spell on Dwarf before being sent to Gibralter in 1917 and then from March 1918 being posted to unknown armed merchantmen. His service record shows him as serving on HMS President III which was an accounting base for men who were posted as he was. He saw the war out and then stayed on another two years to complete his twelve years service. Discharged on 15th October 1920 he was given his Naval Prize fund of £11-5-0 and his War Gratuity of £29.00 before he left the service with two good conduct medals. His commanding officer in Plymouth was C E E Curtoys. Maybe some connection to the house in Blewbury named the same? As is the way with these things, prior to this medal being found, I did identify a Lance Corporal Thomas Eli Alexander who served in the Hampshire Regiment and would probably have investigated him further had he not died in the Balkans. Lt James R C Allee – James was originally from Boxford near Newbury and married a local girl called Roberta (otherwise known as Robin) Hearn in 1912. His father owned a brick making facility and had moved to the area from Hastings in Sussex and had James in 1890 when they were living in Boxford. Not necessarily from a moneyed family, his brother enlisted as a private in 1914 listing his occupation as chauffeur although that in itself was unusual at the time. James full service history records exist in the National Archives. In June 1915 he was serving with the South Midland Mounted Brigade Field Ambulance whilst in 1917 he was given the acting rank of Captain was acting as Adjactant in the ASC. James was acting Captain in the Army Service Corp and was mentioned in Despatches for a deed he committed, reported in the London Gazette of June 11th 1918. He passed away in Surrey in 1976. Sidney Allen – Born to Moses & Emily towards the end of 1893 and living in a house, now demolished, next to The Old Malt House on South Street in 1901 although by 1911 his father was no longer living leaving just him and his mother in the same house. I have not been able to locate his military history. Seaman Charles (Wilfred Lionel) Appleton – Born on new years eve in 1896 Charles served in the navy as J20983. He was the fifth son of William & Sarah Jane, born in Turkeys on Nottingham Fee, but his mother passed away when he was only three years old. His father remarried Lillian Pope in 1901. Charles joined the services aged only 15 in 1911 and was posted, as was normal, to HMS Ganges to learn signalling. The picture of him without a hat on shows him after he passed this course. It was taken in Newcastle in 1913. At this time he was posted to HMS Phoenix, an Acheron class destroyer, on which he was to serve for three years and fight at the Battle of Helioland Bight on 28th August 1914 and then the Battle of Dogger Bank on 24th January 1915. Hi next ship is not recorded but it was a destroyer that was sunk at the Battle of Jutland. This would have been HMS Sparrowhawk or HMS Nestor as all other destroyers sank that day went down with all hands or were captured by the enemy whereas Charles was picked out of the sea by a British ship. The rest of service in the war is unknown but he was at shore base in Portsmouth in 1917 and continued to serve in the navy until 1925 with 3 years in the Mediterranean fleet. He had got married to Lillian Brown on July 11th 1918 in Portsmouth and there first child, a girl, was born there in 1919. When he left the navy the family moved back to the area living in Morton and, for a time, at White Leys Farm. They had another girl born there in 1928, a son John born in Didcot in 1930 and a son Michael at Morton in 1932. They were living in a tied cottage at the time with Charles being a labourer on the farm but after the birth of Michael they moved back to the Portsmouth area where he worked in the building trade. In 1934 they moved to 4 Colwall Road, Cosham, Portsmouth and the next year he joined the Navy again. On HMS Danae he served in the Far East from 1936-38 and when war broke out again, aged 43, he was given a shore posting. In 1947 he left the navy having served a total of twenty-five years but continued to work as a civilian storesman. When he finally retired they moved up to Nottingham and after a time moved to Netherfield where most of the family were living, actually in the same street. His son Michael moved there after twelve years a Sailor in 1950. Charles died on 2nd January 1968 aged 72 years and two complete days. Henry (Rupert) Appleton – Henry is shown as Harry in the 1901 census aged three . It shows him to be a half brother to the four Appleton brothers above with his mother being Lucy Pope. John Barker – John was a brother of Percy (see above) and born in Letcombe Regis three years before Percy. His father was twenty-one years older than his mother and we know that only Percy’s mothers details appear on his details in the early 1920’s although I believe his sisters were still living in the village at this point. John was also the name of his father causing some confusion in trying to find his military records. With such a common name then I cannot positively identify him. Possibly he was the John Barker born February 5th 1896 that joined the Royal Naval Division as R4087? Captain Andrew Basilewitch – Finding out how this man came to be named on the memorial has been a real test. He was born a Russian and I have found proof that he applied for naturalisation after the war. The birth of Lydia Basilewitch is shown as being registered in the Wantage district, covering Blewbury, in 1913 and at the end of 1923 I can trace him to living in London with a single child, Irena, for which he also applied for naturalisation implying she had been born abroad. During the war he served as a translator with the General Staff. Private Prince (Albert Edward) Belcher – Strange to say but there were 2 Prince Belchers listed under the medal rolls of the Great War, both with Berkshire connections. I quickly identified the right one though as his records show an address of The Elms, London Road Blewbury. Born in 1896, Prince joined up for the duration of the war on 16th October 1916 and served in the UK until 3rd March 1917 listing his occupation as Carman. He was number 82869 in one of the labour companies. He did spend until April 1st 1918 in France where he was admitted to hospital twice, once with tonsillitis and thence returned to the UK where he was declared not fit enough to return to France for duty. He was posted to the 4th Monmouth’s in Peckham and then to Cambridgeshire until the end of the War. 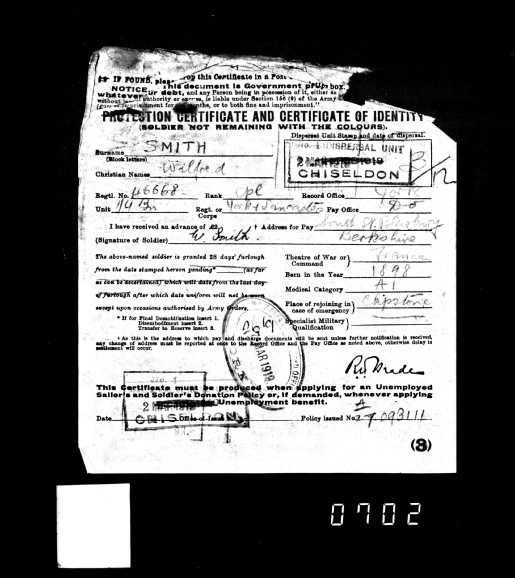 He submitted a claim for disability claiming rheumatism as a result of exposure during the bitterly cold 1917/18 winter period in France, this was rejected after he was examined in March 1920. He had a certificate signed by his employer stating that he had been in good health before service and bad health since. The employer was Thomas Belcher, same address and in 1915 Thos Belcher was a Thatcher in the village directory and in 1935 Prince replaced him in this capacity. Princes’ service records survive and are in a good condition. Private Alfred Tom Busby – Born in the village in 1883 Tom was the son of Vincent and Fanny and in 1891 was living at Whiteshoot up on Woodway Farm where his father was an agricultural labourer, probably with a tied cottage. His parents were also born here. In 1911 he was living with his grandmother, Annie Cummings, and worked as a jobbing gardener. I am certain that he enlisted into the 4th Battalion Ox & Bucks under number 20242 sometime in late 1915 and was then given the number 203701 in 1917. In the second war he was a member of the Home Guard. He enlisted in Reading on January 18th 1915, aged 38 with no children, and was a well built man according to his officers comment. He stood 5 feet 9 inches tall also. He had been a reservist prior to the war but had not been called up again so the one year and 191 days he claimed for it were not counted as service. Perhaps he had been expecting to be called upon and when he had heard nothing he signed up, his 2 years and 269 days were then shown as his service. Richard did not have a fortunate war, he was seriously wounded in the left forearm by a shell when at Grenay in France on June 6th 1915. He had been out of the UK only 11 days and it took a further 7 days before he was admitted to hospital to be treated. He was transferred to England on the 14th and on April 2nd 1917 he signed a form in Reading War hospital so he might affect his discharge which finally came through on January 10th 1919. He played no further part in the war from his wound according to his service record although his medal card does not show he was awarded the SWB. William Butler –The son of Edwin and Emma, born in the village in 1870? Frederick Butler – This has to be Frederick J, son of John and Hannah, born 1883 in village although there are a surprising number of men with these initials who served and I cannot locate any service records for him. However, a marriage to Hilda Mary Cuttill in the Sculcoates area of the East Riding of Yorkshire in March 1915 has been discovered. A daughter named Elizabeth Grace baptised there in 1917. Lt Howard Caudwell – Howard’s war was spent in the RASC, his medal card states he was part of the British Ambulance Commission French Red Cross. He was serving with No.3 convoy and went to France on the 3rd of May 1915. Motor ambulance convoys were responsible for the movement of casualties from the Dressing stations rearwards and approaching fifty of the units were established by the war’s end. The rear of his medal card is inscribed `Field Marshal, Commander in Chief, British Armies in France forwards list of applicants 16.2.19’. I have no idea what this could mean though. He was born in Radley in 1886, the son of Eli and Mary, and in 1911 is shown as an unmarried farmer here although the census states his birthplace as Blewbury rather than Radley. In 1915 he was farming at Manor Farm or rather his commercial activity was still running whilst he was away. Private Fred John Colin – I can only find one man with this name as serving. Enlisting into the RBR as No 19025, He served from 9TH August 1915 before being discharged with sickness on 6th July 1916. Ernest W Crook – Born in Hagbourne in 1893, he was the son of Jeremiah and Sarah A who had lived here for at least fifteen years prior to the war. If Ernest used his initial as identification within the army then I have been able to identify him to one of three men but no further even though one did enlist in the Royal Berks as number 12764 on September 2nd 1914 although that man did have a transfer to the Essex Regiment in November 1916. If he did not use his middle initial then it is a much longer list. Edward Crossman – I have not been able to positively identify Edward. I have traced an Edward A Crossman who was born in Roehampton, Surrey at the end of 1896 and then in 1901 was living in Bradfield followed by Easthampstead in 1911. Some degree of conclusion would think this could be him. However, I can then trace possibly the same man listed in the Army Vet Corp as SE/22760 and at the same time find another Edward Crossman with no middle name who enlisted in the 2nd Battalion East Surreys as 7302 before transferring to the Royal Berks as 59643. This man travelled to France on 23rd Feb 1915. It could be either of these men. Donald S Dean – I can only find one man of this name who served during the war. Donald Stewart Dean, born Reading May 8th 1895 and served in the Royal Navy as J18941. I have not been able to find the link to Blewbury though I CAN FIND Deans in Easthampstead in 1911. Stoker Jesse (William) Dunsden – Although born in Abingdon Jesse Dunsden became part of the fabric of the village. He was a local preacher and Church leader in the Methodist movement and a plaque to his memory exists in Blewbury Chapel. Born November 14th November 1878, Jesse served his country as K40077. He was living in the village prior to this and his son Harold Wesley who is also remembered for his organ playing by way of a plaque in the same chapel, was born in 1910. He was conscripted from his profession as a baker( according to his own records whilst the village directory lists him as an Assistant overseer & insurance agent) and reported for training at Portsmouth on January 17th 1917 standing 5ft and 4 ½ inches tall but having a good broad chest of 37 ½ inches, brown hair and grey eyes. He spent until June 10th of the same year training and then was posted to HMS Cumberland, working as a Stoker first class below decks. He stayed with the ship until he was ashore on February 7th 1919 and was not asked to return, his demobilisation was approved and he was free to return to Blewbury. He passed away in 1955. HMS Cumberland was a fast 9800 ton armoured cruiser launched in 1902, built by London and Glasgow, in Glasgow, she was laid down in February 1901 and completed in December 1904. She was re-commissioned in 1917 and was employed in escorting Transatlantic convoys from Nova Scotia and New York to the United Kingdom. Private Stanley H Ebsworth – Born in 1888 Stanley was related to Arthur who was killed but I have not been able to ascertain what relation. He served in 1st Gloucestershire under number 9982, Arthur served in the same Battalion. Stanley landed in France on November 11th 1914. He was wounded badly enough to be discharged on December 19th 1917 with a SWB. Albert Ebsworth – Born in the village in 1898 to Maurice & Florence. Farrier Sargeant Major Walter Faulkner – Walter was one of those men who answered the call after the initial rush. Born in the village in 1877 he enlisted, aged 37, on November 7th 1914 and gave his occupation as a Foreman Corporal although it is certified later on in his army career that he was a Jockey & Trainer. He had served in the army prior to the war and therefore did not participate in the basic training required. He did sign over 1/6 of his daily pay to his wife on enlistment, she did have two children to look after at the time. He went straight into the ASC as 4219 and with the rank of Corporal. He rose quickly though, as an experienced man, and was appointed to his final rank on April 29th 1916. He had married Ada Roberts on January 10th 1899 at Cookham in Berks with the second of his children Lester Walter being born at East Hendred on October 26th 1901. Jack followed on August 7th 1907 by which time he had moved to Aston. When in Blewbury they lived in one of the Cottages that now make up Dragonwyke in South Street and it was there on the night of September 21st that his wife prematurely gave birth to triplets. Violet Mary lived but Douglas and Herbert survived only four hours into the 22nd. Walter was not present. Violet grew and went on to marry Frederick Aldridge who was killed at the Battle for Monte Casino in 1944. Terry Aldridge, who supplied much of the information, is their son. Being a jockey then Walter bore the trademark height of the profession standing 5ft 2 ½ inches tall and was identified by a birthmark between his shoulder blades on his army form. There exist 22 pages of his army records and they show that he was based on Home service. They also included copies of the death certificates of his two sons born in 1917. He did make 8 journeys overseas, probably on horse transport, in 1914/15, and therefore qualified for the 1914/15 Star. He probably made more journeys after this but these are not recorded. In fact his commanding officer states he did NOT serve overseas. I suppose strictly speaking he did not serve but he certainly travelled there. At the age of 41 he was deemed no longer fit for service and left the army prior to the end of the war. His discharge papers show a date of July 28th 1918 and he had no job to return to. Instead he built Millcroft Stables and became a Trainer, this is after running the Red Lion for a while. He was very successful and is believed to have been one of the first men to own a private car in the village. He was well known in Racing circles becoming a tipster for the Daily Mail. He lived in later years at Y Worry on Bessels Lea. Late on in his life, after Ada died in 1953, Walter lost his sight and although he was living with his son Lester, who had never married, at the time in Y Worry he had to move to a home in Mortimer for care. He passed away there. Lester moved into lodgings on London Road and passed away in Didcot some time later. L/Cpl Leslie Faulkner – Les was the eldest son of the Walter shown above however as was common at the time his enlistment papers may have been filled in with false details. Leslie is not shown on his fathers enlistment papers as existing but it could be that he had left home at that point. He enlisted at Abingdon as Leslie John Faulkner with the age of 17 years and 11 months on November 18th 1916 although he was not called up until February 13th 1917. It did not help my research that his brother, Lester, had such a similar name. He gave his occupation as a Reporter but it was his father who went onto work with the national newspapers. His army number of T292137 shows he was involved in horse transport and his record shows he was on home service until his discharge in March 1919. He had spent time in hospital in Sheringham in January 1919 with an unspecified illness and was excused 3 days duty as a result. It may of course have been the Spanish flu that was sweeping Britain.In 1933 he applied to join the Army supplementary reserve, his surname being spelt Faulkener but then corrected. He certainly returned to the village, living at 2 Eastfields in later life and marrying Louise with whom he had four children, working at the Ordnance depot in Didcot as a clerical officer. He remained involved in village life being part of the football team as one time and on the Parish Council. He also acted as MC with local dances and, according to Terry Aldridge who was his Great Nephew, one of the original AA Patrolmen. Edwin Fry – in 1915 he was a carrier and Landlord of the New Inn and married to Rose Marie with two sons. He was born in the village in 1881 and despite knowing this information I have not been able to identify him military. His service and pension records are not extant. There are plenty of photographs of hime surviving though. He had a fine moustache. Cpl William Gardner – The 1911 census shows William aged 18 as a Carpenter and labourer in the village. He was the son of John and Elizabeth, originating from Upton. Prior to the war he was in the Berkshire Yeomanry as 1667 and so qualified for the Territorial Force medal when he served. This is not a common medal to be awarded. Equally interesting he was a volunteer for the Royal Air Force in 1918 and served under number 403729. Yeomanry to Air Force? His son, Bob, renowned of the village, has his medals. George S Gill –in 1911 there were two ladies living in the village of this name. Freda Hall Gill born 1884 and Marjorie Gill born 1891 were related part of a monied family of cloth manufacturers. There are four medal cards for men of this name though and no service records so I cannot positively identify his role in the hostilities. Driver Ernest A(ugustus) Grace- The son of Abner & Ellen Grace, born here in about 1882. Three pages of his pension record survive and they show he enlisted in the Royal Garrison Artillery as number 17040 in November 1900 at the height of the Boer War. He signed for three years service and nine years in reserve, a total of twelve years although on examination he was moved to the ASC in horse transport. This makes some sense as he was a carter. As to his service in the Great War then I can only find his medal card that shows him as being awarded the Victory medal and the BWM as well as a SWB and being discharged as a result of that wound. Ernest was the father of Jack Grace, a well known and respected figure in the village. Private William (John) Grace – William enlisted on December 21st 1914 giving his age as 43 years and 291 days. He gave his address as the Catherine Wheel pub on London Road where he was the Landlord and had lived in the village all his life. He was born in Hollytree Cottage, the son of Zephania and Selina, Zephania’s second wife and was working as a carpenter in 1914 with the average height of 5 feet and 5 inches. With all the privations of the war going on then to find a record exists that shows he received Punishment of 2 days CB (confined to Barracks) for failing to fill water bottle, Nov 27th 1915 seems impossible to fathom. Especially as he did not need to volunteer for service. On June 27th 1917 he went before a medical board in Oxford, aged 46 he was put into category C2 and transferred to the RAMC as number 446189 and was working in the 3rd General Hospital. He never went overseas, and was married to Louisa according to his papers. Tom Grace – The brother of Ernest (above) born in 1881, I have not been able to locate any military service or pension records for him but I have discovered he lived opposite Wilf Aldridge’s workshop on London Road in Treblehouse and worked for Wilf. Albert Grace – The third of the Grace brothers, sons of Abner, to serve although again I cannot locate his military records. He worked for Mark Street on his coal round. Private Aubrey (Jack) Green – I discovered that 57 pages of Jack’s service and pension records have survived, an amazing amount. He was a fruiter and horse dealer when he enlisted in January 1915 aged 19 years and standing 5 ft 5 ¾ inches tall.. He joined the Royal Berks as a driver, obviously with horses, and was serving in Britain. Quite early on in his army service he caught scabies and was serious enough to spend time in Kings Lynn hospital from 27th January 1916 until 4th February 1916. Why Kings Lynn is unclear although his transfer to the Army Service Corp on 1st September 1916 may hold the clue, he could have been seconded to an agricultural unit over there. Jack was to spend another short time in hospital, this time with influenza, from 29ths January 1917 until the 3rd February and this is when the war was to involve him with a vengeance. At the time Britain was running short of men for overseas service and many of those who were not frontline soldiers were being interviewed and sent to training camps with a view to becoming combatants. On 23rd March 1917 Jack was sent to Ripon for just such reasons and, after basic infantry training, found himself at Folkestone on June 12th. He continued with training at Etaples camp in France until the 28th when he was transferred to the 8th Battalion Loyal North Lancashire Fusiliers. They were sent up the line and into the trenches in the Ypres salient. On the 31st August Jack was first admitted to the 12th CCL and then the 69th Field Hospital, his physical injuries were a shrapnel wound to his left arm and a slight wound to his scalp on the right side. He remained in hospital until the 12th September, being transferred to Rouen before being treated for concussion in hospital there until the 18th September 1917. Jacks wounds were not all physical though it was these that saw him sent back to the UK for treatment in Stourbridge hospital before being returned to service at Fulwood Barracks in Preston. In his completion of his pension forms Jack stated under cause of injury `Blown up and buried at Ypres in A company, LNL, August 29th 1917’ and this may explain why he was sent to Liverpool Military Hospital for an overnight stay on 1st November 1917. He spent 290 days in Maghull hospital, from 4th January 1918 until the 19th October 1918, with no reason given. However, this is directly below the previous hospital admission for Shellshock and on being discharged the notes `No operation performed’ and condition ‘Normal` are written so we can surmise it was the same problem. On the 23rd October he was in Felixstowe, with the 3rd Loyal North Lancs, possibly for shipping to the war again and his papers state he was returned to base as unsuitable. The war was soon over and although he was not admitted back to hospital the army still had some use for him. 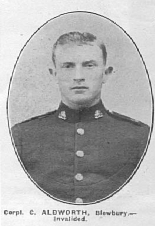 He was compulsorily transferred to the 432 agricultural coy on 12th November in Bedford from No 3/27956 3rd LNL. He saw one more transfer as No 670187 to the 580th agricultural coy before being granted sick and wounded leave under this number in January 1919. He went home to his fathers address at the time, 258 Oxford Road, Reading, and was demobbed properly on 20th February 1919. Charles Greenough – This can only be the Charles born in 1870. As this would have made him around 44 at the outbreak of war then he would have been excused early sign up unless he was a Reservist. There are no service or Pension records for a man of this name and only three soldiers who qualified for medals existed although they all had middle initials. We can rule out the Grenadier Guardsman who was a regular in 1914 which leaves us with a choice of Royal Defence Corp or Army Service Corp as Charles’ military history. The RDC man also received a SWB but I have not been able to identify any further between the two. Sapper Eli Greenough – Only one man of this name, or rather initial, received medals. He was in the Royal Engineers serving under number 215774. If we can assume this is the same man then he was born in 1872 according to the census. It is entirely plausible he enlisted despite being aged 43 when the age limit was moved upwards in 1915. If we take into consideration that the man below also enlisted in the Royal Engineers then it would be something of a co-incidence. Sapper Reginald G(eorge) Greenough – Anyone searching for his medal card would come up with a blank as it is listed under Regiment G Greenough rather than his proper name of Reginald. Born in 1895 he lived in later years at Fron Deg. His service and pension records, if this existed, are not saved. Private Raymond Greenough – Otherwise known as Harry, Raymond enlisted into the 4th Reserve Battalion of the Royal Berks as number 3532 on the 28th December 1914. The war had not ended by Christmas as was expected. He was called up on the 22nd January 1915 and at that point he was immediately discharged due to the fact that he had lied about his age on his attestation form. It could have been that his father George and mother Alice, living on South Street, had a hand in informing the authorities of course as he was only 16 or 17 when he enlisted as it was unusual for men to be turned away if of good stature regardless of age. He had told the officer he was 19 and half years old and standing 5 foot 5 inches tall with a decent chest of 35 1” inch girth then he could have passed for it. Raymond stated he was born in East Hendred and was an assistant to some trade which is not legible. He may have re-enlisted when he was older, that record does not survive if he did and has not been attached to his existing record. However, a Raymond Greenough joined the Royal Berkshire regiment sometime in 1917 as number 201520 and a medal bares witness to this. I suspect that this is the same man. After the war both he and his brother Reginald worked in the Building trade living at Carramores for a time. Albert E Greenough – The 1901 census shows Albert as being born in 1895 although it does not use his middle initial. A search of the service and pension records reveals nothing but there are four Albert Greenoughs who survived the war and they ALL served in the Royal Berkshire Regiment except one who was in the ASC. All were men who did not enlist at the start of the war, the only Albert who did was killed. Two of the men had middle initials that were not the letter E so we can deduce it was one of the other two. Both saw the war through without serious injury. Henry Greenough – Although the census shows me he was born in 1897 in Berkshire this is all I know about this man. There are a number of Henry’s or Harry’s with medal cards but no service or pension records match up to `our `enry’. William Greenough – The 1901 census shows two men of this name in the village. One born in 1893 and the other in 1899. It could be either one of these lads and as there are no service or pension records to match up and the medal cards show no further clues then I cannot tell you anymore about them. I do however suspect that this is the 1893 man as the next record seems to exclude the 1899 born one from being this William. Private William (CFG) Greenough Junior – William Charles Frederick Gregory told the army he was born in 17 years and 11 months old when he enlisted in Abingdon on 19th February 1917 using his full name. They squeezed it on the enlistment form by writing is almost sideways. At the time he was an Engine Driver, the likelihood was he was a Traction engine driver rather than a Locomotive one. 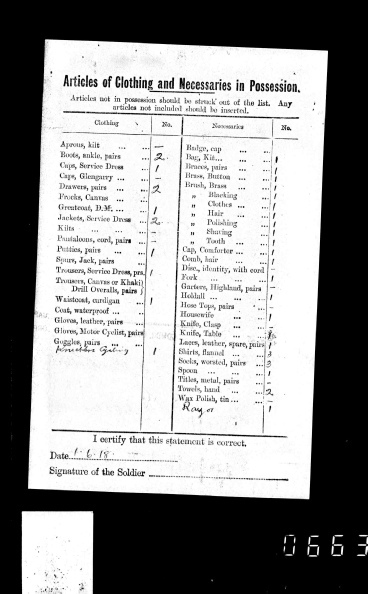 He was attested into the Hampshire Regiment as number 357213 and was quite a tall lad at 5 foot 5 ½ inches tall. He gave his next of kin as his father Charles, living on Westbrook Street and was called for service on 23rd March 1917. He spent the next year and 242 days here in the UK until finally being sent to France on 19th October 1918. He stayed there until after the war ended, infact until 26th march 1919 and was then retained in service until 8th July 1919 at which point he was declared unfit and discharged. His record shows no details of him being wounded so it may have been an illness he contracted. It does show in some detail his movements during his short service. He was originally posted to the 9th Battalion Hampshire Regiment but after only 3 months was sent to the 4th Reserve Battalion. When he went to France he was serving with the 15th Battalion. Tom Greenhough – Thomas certainly lived in the village and appears on the 1901 census. This shows him as being 14 years of age. A check of the Military records only shows up four men of this name and one is from Berkshire being in the employ of Lady Wantage at Lockinge. There is nothing to tie him in with Blewbury prior to his service apart from his name. He enlisted in 1910 for six years and, at the end of that time, he was allowed to leave the Army. They tended to stick by the contract made. I can’t say for sure they are the same man, for instance there is a difference in age of four years, and it could be that this man then moved to Blewbury. But I can’t find that proof so he will have to remain a mystery for the time being. Private Charles Gregory- In 1911 Charles, his wife, son and two daughters were living on Westbrook Street although there were two Gregory families in the village. He was born in 1879 and although I have not positively been able to identify him I have located details of a man signing on as a new army number, so sometime in 1917 when he would have been called up, into the Ox & Bucks LI under number 203366. This man was then transferred to the Labour Corp, which usually happened to men who had been labourers or were not the young men required for the frontlines, under number 411290. Although there is no date for transfer to France this is normal for those cards filled in after mid 1916. The man concerned was granted a discharge and a SWB. Seaman Frederick Gunnel –In 1911 Fred, who had the middle name of William, was lodging with Herbert & Martha Johnson two houses down from the New Inn on London Road. He was working as a Baker. He was born on August 22nd 1886 in Thatcham and when he enlisted into the Royal Navy as M22926 he overstated his age by a year although that could have been a clerical error. His full service record survives showing the ships he served upon except it has two letter L’s rather than the one used on the memorial. After the war he returned to the village and commenced work with Mark Street on his coal round at some point. He was related to the Streets by way of marriage, he was an uncle to the three Street brothers Charlie, Ralph & and he was living on London Road again just down from the now demolished Cricklewood. He died in Wallingford in 1970. Lt RL Guthrie – The 1911 census does not show anyone of this name living in the village. We do have a record of a RL Guthrie and the story is very detailed. R Leonard Guthrie was the brother of Margaret Guthrie who was married to Andrew Basilewitch (see further up this list) and the Basilwitch’s rented Edlins in Aston Upthorpe. But I can only locate one officer of similar initials. His service records do survive although it is his medal cards (note the plural) that I have referred to. The card with his general medals on show his name as being Robert Moorstead and please forgive me if the second name turns out to be slightly incorrect as it could also read Moorshead.. So not RL as the memorial states. He worked his way up from a Colour Sargeant, to a Temporary Quartermaster and Honorary Lieutenant with the 6th Royal Berks and then finally Captain and Adjutant with the 1st Royal Berks. This last rank may well have been right at the end of the war. Clearly he saw some service though as he was awarded the Meritorious Service Medal and Mentioned in Despatches for an act of conduct in 1917. As such he has four medal cards as the last two awards carry their own record and his appointment to a Commissioned Officer also required one. He first landed in France on July 26th 1915 with the 6th Battalion and it appears served the war through. There is a record of him marrying in London in 1904 but also he married a Woman with the surname Lewington in Berkshire at some point after 1916 but again I can find no trace of that name in the village. He passed away in the county in 1941. Or it could be that the two men are very different. Sidney Hearn – Sidney & Fred were brothers. Born in Blewbury in early 1885 I believe his true name was Edger Sidney. I have narrowed his Military record down to two men. The first served as a regular Soldier in the 1st Royal Berkshire Regiment, his brother was a regular soldier also. The 1911 census shows their Mother as living alone but Fred and his family are also in the village. The second man was an enlistment sometime at the junction of 1914/15 into the 2nd Ox & Bucks, the same Battalion his brother was killed serving with in November 1914. That man went to France on May 26th 1915 and saw the war through. Whichever Military record he held he returned to Blewbury to live with his mother here in Yew Tree Cottage opposite Farthing Down. He was one of the water cress farmers on Watery Lane. He passed away in 1944. Staff Sargeant Frederick (John) Hester – Freds war service came about as he was an enlisted man prior to hostilities. His medal card shows him as a Staff Sargeant T15617 in the ASC and that he shipped to France with No.2 Coy, 2nd Divisional Training, on 15th August 1914. I was able to positively identify him as he was shown in the 1901 census as a soldier in barracks in London. He was born in the Newbury area of registration in 1881. The 1911 census shows his aunt, Suzanna Hester, living here at the age of 67 and it is this link that has ensured his listing on the memorial. It appears he saw the war through without wounding. I had expected to find Pension records for him but this was not the case. He did marry a woman by the name of Bradley although I am not sure of the date and I do not believe he returned to the village to live. George (Alfred) Hillier – George and his brother Louis were born in Hurst and in 1901 were living at Bowsey Hill near Hurley. Their parents were William & Mary Ann with father being a woodman and elder brother a gamekeeper. In 1911 he was living within the parish with his parents. I have not been able to positively identify his service details. Driver Lewis (Edmond) Hillier - Louis (spelling on records) was a baker residing in Wargrave. He enlisted on 10th August 1916 aged 29 years and 1 month but had served in the RASC prior although I believe it to have been during the war. Perhaps he signed up and then was rejected and signed up again, as there is another number on his service record. It also states `Called up from A. R class B (Army Reserve Class B) as number T4/215219. He saw Home service until 3rd February 1917, away from home though, and was granted leave during this period being reported as 1 day late returning on 27th January 1917. Then he was sent to France for service only a week later. He was posted to a Road Construction company, rather odd for a baker, but he was not involved in the food supply for them. He had only one leave period during the war, from 27th January 1918 for two weeks, and stayed on in France after the armistice no doubt very busy with the reconstruction of the countryside. He was granted leave from 21st January 1919 to 4th Feb 1919 and again from 29th May until the 12th June which was then extended until the 20th June so quite a long period. He spent foiur days in hospital from 5th November 1919 with Bronchitis, this was of course the period of the great influenza pandemic, before finally being demobbed on 8th January 1920. He had actually returned home on 9th December 1919, in time for Christmas, and was just awaiting his papers. He escaped injury the whole of the time he was in France. Private Albert Hornblow – Albert was another local man who served in his local Regiment. The 7th Battalion was formed in 1915 and entrained for France on September 19th 1915 with Albert aged 25. He was number 16596 and had been living at Lower Chance Farm with his mother Emma who originated from Herefordshire. It appears that he came through the war unscathed and was retired to Class Z at the end of hostilities with no pension though. Private William (H) Jackson - ? Rev Alfred Brook-Jackson – The Reverend Jackson finally applied for his medals on September 12th 1923, perhaps so he may show them at the Rememberance service that would be held officially for only the second time in the November of that year. He had served as a Royal Army Chaplain, travveling to France to be with the troops on June 25th 1916. Only 5 days prior to the one single day that saw the British Army suffer its worst ever loss of men. Nineteen thousand killed and thirty-eight thousand wounded in twenty four hours on July 1st 1916. The first day of the Battle of the Somme. A British soldier fell every one and a half seconds of the entire day. Richard James – Richard was born in Farnborough near Wantage on 29th October 1891 and in 1901 his family were living at Lower Chance with his father Peter and brother Sidney employed as Shepherds. His mother was Annie or Mary Ann as stated in the 1911 census in which his father does not appear. In this census his middle name is shown as Goodchild, that with which he was registered. Usually that would refer to his mothers maiden name as was the fashion at the time. Assuming that he continued to use his middle initial then I can narrow him down one of only two soldiers of that name. Oddly they both served in Egypt, one with the Honourable Artillery Company and the other with the Royal Engineers. The latter was discharged with a SWB however I cannot say for certain which of these men may be our Richard G James. He passed away in Surrey in 1969. Walter Lay – The census shows Walter John being born in June 1890 to Thomas & Annie here in Blewbury. In later years Walter worked as a handyman for DR Moon in Aston Tirrold, he had married after the war to a Mrs Howard who originated from London. He passed away of infected sinuses aged only 52 in 1942 whilst his son Norman was away in the Tank Corp.
Ernest Lane- A Miss Lane was living in 1915 at Brook cottage, perhaps they were related. Private Herbert Leach – If a man enlisted for the war then a record was made of his enlistment, even if the next day he was refused entry as not suitable. Thus you have many records surviving of men who were discharged as not suitable for service. Some were suitable for other service though, as a result of medical conditions, and their willingness to assist in the war effort was appreciated. Herbert signed up on the 31st August 1914 as No 3521 into the 4th Battalion Royal Berks. He had already served a minimum of 12 years in the army as he is stated as a time expired veteran of the 1st RBR on his form. He was 39 years and 4 months old at the time and his medical condition played a part in the decision, after 96 days, to transfer him to the prison service as a guard. He was dyslexic, had poor feet and only one….,. this part is unreadable, but was more than keen to do the job. His address is shown as The Malthouse on South Street where his family had lived for many years, he had been born here in 1876. He had been an assistant to his father Henry working the land owned by the Malthouse which was classed as a farm. Private Joshua (John) Madgwick – Joshua was living on London Road in Blewbury with his wife Florence and three children Henry, Margaret and Kathleen when he enlisted on 6th January 1915. However, he had been married at South Stoke on 24th March 1906 and his children were either born there or elsewhere and he was a relative newcomer to the village at that time. His rank is actually listed as `Horsekeeper’ on his Army documents. He was born in 1877, being 38 years of age when service commenced, and when he enlisted he may have done so for a particular reason as he volunteered for the Veterinary Corp at Cowley Barracks before October 1914 and received a letter of confirmation of his acceptance in that month as Number SE 3091, service being for the duration of the war. He had been a time expired soldier prior to the war, his service being up on 12th November 1907 when he was number 4487 in the 2/1st Royal Berks probably having served 12 years. He reported to Woolwich on 7th January 1915 and was likely involved in the shipping of horses to France as he embarked at Southampton and his ship landed at Le Havre only one week later. His records are very faded but clear enough to show that from then until 19th January 1919 he was only granted 8 days leave in total, that being in the middle of 1916. He had spent days in hospital too, from 9th April to the 17th of April 1915 for reasons unknown. He had several other stays in hospital during the war but the records are too faded to reveal when and for what reason again. Finally on the 19th November 1918 he was again admitted and this time did not recover enough to be fit for service. He was invalided home on New Years Eve 1918 and straight to Carlisle hospital before a return to Blewbury on 16th January . It was not uncommon for men to be invalided from France to Southampton and then be put on a train heading to Carlisle or Glasgow to hospital. This would have been a military hospital, at the time beds were at a premium still because of the influenza and also the sheer number of wounded men requiring care. His records do not state the nature of his wounds though. He must have applied for a pension, his records show that in 1920 he was living in Lower Calthrop in the employ of a Farmer, Mr J Lay. Sarjeant Henry (Harry) Middleton – Harry had a very long Army career and served the village as landlord of the Red Lion pub also. He was born in South Stoke in1868 and on the 27th July 1883, at the age of only fifteen and seven months, he had joined the 1st Battalion Royal Berkshire Regiment as Bandsman 846, listing his occupation as musician and he was designated a Drummer He stood 5 feet and 1 ¾ tall and weighed only 105lbs though. On enlistment he gave his next of kin as his sister Eliza Baldwood with an address unknown although she is later traced to living in Cheshire. From 4th October 1886 he travelled from Cyprus to Malta and finally Bermuda until 20th December 1893 although he was rtecognised as a good soldier early in his career. Harry was made a Lance Sgt in 1890 and a full Sargeant a year later aged only 23. Having served twelve years with the colours he was discharged and transferred to the reserve on 11th April 1895. He again was called to service during the Boer war and was under Army control from 1899 to 25th July 1904 and on leaving he married Emily on 1st October of that year. He was probably at this time using his qualification as an instructor of Musketry and, living at Vine Cottage on South Street, he was employed as Range Warden at Churn camp. When war broke out then he immediately put his services forward to train troops on the Churn as the Range Warden and he was accepted on 6th October 1914. His papers show him as changing a little since his original enlistment, he was now 5ft 81/2 inches tall and weighed 159lbs. On the 27th September 1916, aged 48, he was finally discharged from the army under number 23077 as being no longer physically fit for duty with his only daughter Lily Charlotte Selina aged nine years old being listed as a dependant. He was shown as suffering from Rheumatic Arthritis, Gout and Myalgia and had been spending time at Bath hospital in re-cooperation. His rank on discharge was CQMS. 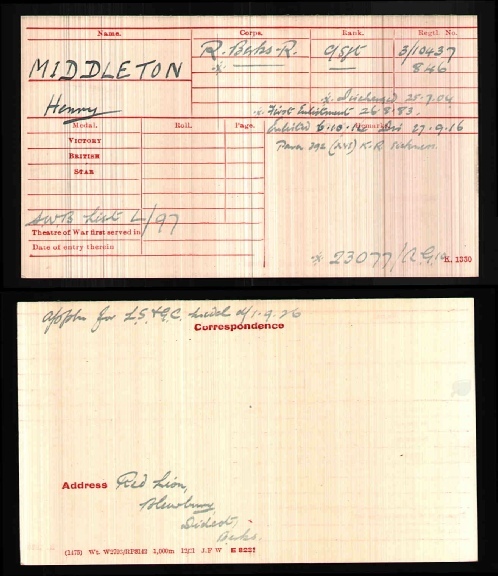 The card is addressed to him during his time as landlord of the Red Lion which was after the war, either late 1920 or mid 1921, and shows his application for his long service and good conduct medals. A 1912 picture of Harry in uniform exists in the Blewbury 100 years in photographs, Number 53 shows him enjoying a pipe. Oliver Henry Middleton died of a gastric ulcer at 53 Blandford Road, Reading on the 18th December 1946. His daughter LCS Corderoy was present at his side. Captain Guy Warneford Nightingale - Although Guy was born in India his mother, Maude Nightingale, came from the privileged classes of the time and he was privately educated at Rugby. You could possibly say that he was expected to do well in the war. His cousin, RAJ Warneford, was awarded the Victoria Cross whilst serving in the Royal Navy and had a tablet dedicated to him at Highworth Church in Wiltshire. He had destroyed a Zeppelin whilst flying a patrol over Belgium. The 1911 census shows a Mr Walter H Nightingale and three females living at St Michaels Cottage on Church Road. Guy was serving with the Royal Munster Fusiliers at Gallopoli on 25th April 1915, he had been with the regiment throughout. He went ashore from the transport River Clyde to V beach, an absolute hell, where his boat was beached eighty yards out and cam under intense fire. His regiment had followed in the initial assault by the Dublin lads who lost 21 officers and 560 men in just fifteen minutes. Guy actually made it ashore but then was asked to return through the same open waters to the ship to advise them not to send any more men as the assault was failing. He did so and then, even more remarkably returned to shore to be with his Regiment. Dark came at about 5:30 and things quietened, allowing the men on the beach to tend to wounds and dig cover from the shells and snipers. When light came then Guy, with his commanding officer, led a head on charge up Hill 141 against the Turks. The Colonel was killed at Guys side as they charged and he buried him that night. Eighteen days later a photograph was taken of the surviving Munster Fusiliers by Captain Warneford. They totalled 5 officers (out of 26) and 372 men (out of 1002). Guy was senior officer and as such sat on the court martial of a man who went missing for two hours whilst on sentry duty. Private Davis, having survived all of this, was executed. Only 40 men who were in the original embarkation rolls left Gallopoli. When the armistice was signed Guy was in Lille and decided to carry on soldiering. He volunteered to fight in Russia in 1919. His medal card for his war service mentions `emblems’ which could mean he was mentioned in despatches at some point. He died young in 1935, only 43 years of age, of alcoholism whilst retired from the army in Somerset. His letters and papers covering the Great War, of which there are many, are kept in the Public Record office (PRO 30/71). Driver Alec (Frank) Pepall – Born in the village in 1890, he served in the Royal Horse Artillery under service number 616400. I believe he may have been a pre-war serviceman. He married Winifred in 1911 and, I may be wrong, but appears to have a 3 year old son called Geoffrey Howard at the time. It is known that he was a carrier in the village. Charles E Randle – 1915, Chas Alfred Randall, racehorse trainer, Treble Lodge. Perhaps this means Treblehouse Cottage and he was a lodger? Private Walter Ravening – Walter and his brother Cecil (see below) enlisted together into the RAMC. They were numbers 89539 and 89540 respectively. Walter served in France, his brother? well see below. Prior to the war then Walter was a Roadman and served on the Parish Council. Walter returned here after the war when his mother living at the Eastern end of London Road. He again served on the Parish council on and off until the mid 1930’s. Private Cecil Ravening – I think it would be fair to assume that Walter and Cecil by signing up together on 31st May 1915 hoped they may serve together. That was not to be the case. Cecil was the older/younger being born on 16th July 1894 and was here in Britain serving with the 3/2 South Midland Field Ambulance unit until Christmas Eve 1916 when, rather ungraciously, he was put onboard HT Pakeha at Devonport for Mesopatania. Whatever route he took he arrived for service in Basra, having changed ship to the HE Ellenga 86 days later. He joined for duty on the 1st May 1917 but only 2 days later had been admitted to hospital suffering the effects of the heat. He spent 23 days there before being sent to a rest camp in Baghdad and eventually rejoined his unit on 30th July 1917. His health then remained good and he was in service until the 9th June 1918 when he was again admitted to hospital in Abbas. 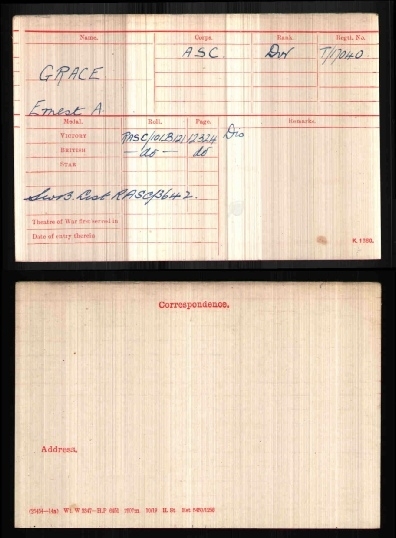 His service form then remarks he was dangerously ill on the 20th July 1918 although it does not state the cause. He was removed from this list four days later but remained ill. So much that they invalided him to India from Basrah on 31st August 1918. He arrived in Bombay and was diagnosed with Bronchial Pneumonia in the 34th (Welsh) General hospital there. They could not do a lot for him and so sent him back to the UK to Woking hospital, on board HT Deranha on 10th January 1919 arriving 18th February. Cecil had not taken well to foreign climes, his services to the crown were disposed with on 23rd May 1919 after 3 years and 358 days service. After the war Albert joined the Blewbury cricket team and lived on the London Road in one of the then council houses. His grandson, Neil Webb, went on to play football for England. 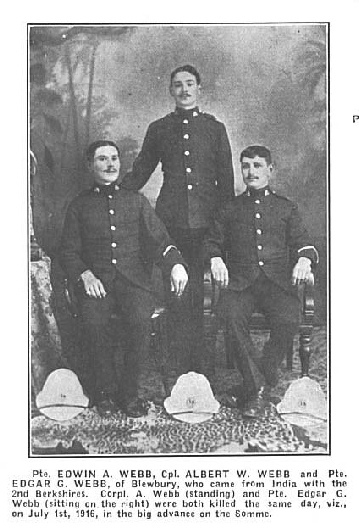 Thomas C N(ewell) Smith – Thomas was the eldest of these three brothers (see next two men) and having survived the war went on to live to the age of ninety-one in Blewbury. Ronald E(phraim) N(ewell) Smith –Born here in late 1889 Ronald did not return to Blewbury after the war ended, his nephew Derek Smith never met him. George N(ewell) Smith - Born in Blewbury in Sept 1893, and one of the three Smith brothers who enlisted. Sons of the Schoolmaster here they were true lads of Blewbury. George served in the 132nd Royal Garrison Artillery with an original number of 600 later revised to 291962. The 132nd were known as the Oxfordshire Battalion being made up of men from the county. They went to France in March 1916 with four sixty pounders and were made up to six guns in the October. There are only five months of the Battalions War diary surviving, covering the period April to August 1917 and they did suffer some serious casualties during the war. They were part of the 76th Heavy Artillery Group from December 1917 though and that war diary survives right through to 1919. The unit came under enemy fire frequently as it was a forward support unit and would be targeted by German artillery who followed the gun flash through observations. Private J(oseph) W(illiam) Smith – Will, as he was known, was born in Ealing on 1st February 1890, the son of George Henry and Harriet A Smith and the brother of Jesse (see volume 1) as well as the brother of Charles and G Henry (see above), Wilf and Baden (see below) . All five brothers served in the war. He emigrated to Canada in 1912 with a good friend Jack Dyer from Swindon. They had been working together at Jack’s fathers hotel and, depending which side of the family you talk to, he left in connection with the Canadian Pacific Railway offering posts or he had had some bad luck in a relationship. Will took up work near Winnipeg as a farmhand where he did a deal in 1914 with the owner, working on a share of the profit for the yield. It was a bumper year and he made enough to return to Britain for a visit. Of course, whilst he was here then war was declared and he went to enlist in the army. Being slight he was turned down due to the regulations at the time and so returned to Canada. He was approached in the street by a recruiting sergeant who enquired why he was not in uniform and promptly enlisted him in the 101st overseas battalion on 21st December 1915. He was trained and duly sent to France as a draft replacement for the 16th Battalion otherwise known as the Canadian Scottish, arriving in France on the 28th August 1916. He was immediatly thrust into the front line as the battalion became involved in the continuing battle of the Somme. They were stationed around Mouquet Farm and had continued attacks against the German lines. All of this was a virtual warm up though for the engagement that was to mark the 16th Battalion down in Canadian military history. At 1am on 8th October 1916 they attacked Regina Trench near Courcelette. The next 14 hours were brutal, bloody and devastating. The Regiment, held by wire, were encouraged by the sight of an eighteen year old lone Piper walking up and down the wire urging them on for which he was awarded the Victoria Cross. The wire was cut, the trench taken. He was only killed after returning to collect his bagpipes having left them in the trench when the Germans counterattacked, he was never seen again. The regiment were relieved later the same day and fewer than 250 men from the original 1000 were left standing. Will’s memories of the time were `days wearing a kilt and fighting in mud and lying on a stretcher for a long time in rain before being collected from the battlefield’. His 42 days in France had been intense. He was evacuated to England although I can find no evidence of him being wounded, the entire Battalion was withdrawn from the line, they simply ceased to exist and the majority of those men involved in the attack of the 8th October never again took part in fighting. It was decided that many of the survivors would become training staff for the Canadians who would follow and thus this man who was refused a place in the British Army was appointed to the Physical Instruction staff of the Canadian Army training Welsh miners to be fit soldiers. He was made an acting sergeant on 10th April 1918 and finally returned to Canada before being signed off the army on 8th July 1919. He was married to Eva in 1922 and went on to have children who have kindly assisted in the telling of his story. Corporal Wilfred Smith – Born 1898 in Jessima Cottages Blewbury, Wilfred’s mother was Harriet Ann Smith and his brothers the four men named Smith above. A tall lad at 5 feet 8 inches tall and with a 35 inch chest, aged one month short of his twentieth birthday, he enlisted on 9th November 1915 whilst serving as a groom and gave his date of birth as 1896 so he could serve abroad. Originally 19450 in the Royal Berks he was transferred to the Devonshires after training and soon achieved the rank of Lance Corporal. Arriving in France on 10th November 1915 he went straight into the field where he received a shrapnel wound to his scalp on 18th August 1916. This may have been quite a serious wound as he was shipped back to Britain straight away arriving here on the 20th. He stayed in Britain until 28th April 1918 when he was transferred to the Ox & Bucks Light Infantry and given the rank of Corporal. At this time the Germans had launched their Spring 1918 offensive only four weeks earlier and troops were needed in France to make up for those lost in this. Wilf was transferred to the 1 / 4th Battalion Yorks & Lancaster Regiment as Private 46668 on10th May 1918 as they were likely heading straight to the front from the depot he was at in France and were short of men. He was appointed back to Corporal at the end of 1918 though his medal card shows him as acting corporal, it also does nor mention his brief transfer to the ox & Bucks. Private Baden Smith – Baden was a popular name at the turn of the century, due to Lord Baden Powell’s efforts with the scouting movement and youth of the country, and if you add Smith to the equation then the task of identifying the right one becomes more arduous. Luckily a search of the service records found him identified by the fact his mother Harriet Ann lived on South Street in Blewbury. Baden was born in 1900 and stood a good chance of missing war service. He had been keen to work though and was a Locomotive Fireman working from Didcot shed on the Great Western Railway. He was lodging with a Mrs Evans in Wallingford Road, Didcot, when he was called up to the training reserve 7 days after his eighteenth birthday on 28th August 1918. Not a tall lad at 5 ft 3 1/4 inches tall and having a 35 1/2 inch chest he was appointed to the Royal Warwickshire Regiment as number 169566 and the likelihood is he was shipped abroad either just before the armistice although his record is not clear. What is shown though is that he transferred to the RAMC on 11th August 1919 and was stationed in Cologne as part of the army of occupation. He was granted leave for two weeks from 24th October 1919 and was demobbed on 28th April 1920. He too emigrated to Canada, possibly in 1922 with his mother, to join his two brothers Wilfred and Will. Private Ernest Street MM- The Battle of Fromelles which took place in France on the night of the 19th July 1916 has been in the news recently. The discovery of a mass grave of unidentified soldiers, buried by the German Army, has led to requests for DNA to identify them. Before the battle took place it was decided to get intelligence by way of trench raiding parties on the German lines and on the evening of 13th July four officers and one hundred men of A company 2/4th Royal Berks were summoned by a bugler, and it is known that Ernest played the bugle. The only identification the men were allowed to carry was their identity discs and all other markings such as badges, letters, paybooks were removed from them. This goes some way to explain why so many men who were killed were never identified. The plan was that at midnight they would leave the trenches and lie in no mans land, only seventy yards from the German lines. However they began to move out at 11pm through one exit and were immediately hit by heavy fire. One group of twelve men did manage to make it through to the German lines but were never seen again. The rest lay out in no mans land, with sporadic fighting, until at 4:15am stretcher parties were sent out. Ernest was amongst these bearers and as dawn was approaching they darted from shell hole to shell hole to avoid being spotted and also to treat the wounded men sheltering in them. The Battalion war diary states that two NCO’s (Non Commissioned officers) and six men `showed fine spirit in bringing back their wounded comrades from the enemy wire’. It also states `much gallantry was also displayed by several men in bringing in the wounded’ when assessing the attack and Ernest is named amongst them. One officer and six men were killed, the other four officers were wounded along with fifteen men and the men who made it to the German wire were listed as missing. Ernest was recommended for a gallantry award and was issued a parchment in recognition of the bravery he displayed at Ferme Du Bois that early morning. It stated he behaved with the utmost coolness and set a fine example to his comrades. Six days later he took part in the main attack which has been so well documented in the news programmes of late. 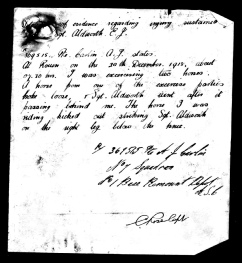 The original parchment is in the safe keeping of Blewbury Local History Group, the Military Medal that Private Street was awarded for bravery later in the war is in the care of his family in the village. His medal card shows that he applied for a replacement of all his medals on 15th Feb 1924. We do know that after the war in Europe had finished he went to Russia to fight and after the war, at the service of remembrance, it was he that sounded The Last Post. Driver (Elijah) Mark Street – Forty pages of this mans record survived the German bombings. A noted village character he gave his occupation, as many know, as that of Coal merchant contractor with his mother named as Charlotte. On 11th December 1915, aged 37 years and 8 months old, he stood 5 feet 6 ½ inch tall. Enlisting as 238478 into the Royal Field Artillery he would have been working with the horses that pulled the gun carriages as a Driver. He saw home service from 5th May 1917 when he was transferred as a Lorry Driver to the Motor Transport section of the RASC until he was compulsory transferred to the Army Reserve on 3rd August 1917. Despite this he was sent to France as a spare driver on 6th October 1918 with the war almost over. Strangely three days later he was given leave for two weeks and then had to return. He stayed there until 19th March 1919 before being demobbed. Private Charles Styan - Charles being shown on this list is a little surprising if you read on. He was born in late 1889 in Mackney, Lincolnshire (near Thorne) and had a sister called Minnie who was only one year younger than him being born in the middle of 1891. In 1901 they were both living in a cottage at Steventon with a Martha Bedwell who is employed as a seamstress and trouser finisher but is also a Tailor. Both are described as boarders and I think they may have been studying at the local school or been Bernado’s children, Martha was a spinster of 42.. I have not been able to locate either of the Styans in the 1891 census for the United Kingdom though his sister perhaps would not show. His attestation into the Canadian army means his details are saved though (below). This shows his next of kin as Minnie Styan living in Cheshire, He was an apprentice engraver, enlisted 20/9/14 and was in the Stanstead Dragoons militia prior of the Wesleyan faith. Lt Felix (John) Watson-Taylor – Research into this officer has revealed information that I have not seen before. His medal card shows him as serving in the Wiltshire Yeomanry as a 2nd Lt and then in the 1/1st Staffordshire Yeomanry as a Captain. I believe he enlisted very early in the war, certainly before October 1914, and served in the Wiltshire Yeomanry for the majority. However, the top of the card states 'Suspense list enclosed in file 11/10/21'. We can assume this to be the date his service finished, perhaps in the Territorial Battalion of the Staffordshire Regiment. Further below this it states '*Removed from the Army. H.M having no further use of his services 11.10.21 Extract from the London Gazette No 32482 of 7 / 11 / 1921'. The card shows 'award of medals not approved min 2 nw/8/8081'. The other side of the card 'EF9 returned 8.1.21'. Officers had to actually apply for their medals unlike enlisted men and this shows that Felix returned his application on 8th January 1921 giving his address as Dibleys, Blewbury. He was certainly there in 1920, listed as a Captain. Felix’s family were wealthy, they had made a fortune in the West Indies prior to the war years, and were and still are very much part of the money set of society. He was born, one of five brothers, on 6th December 1889 in Folkestone. He moved to the area at some point though and then remained here after the war and he had a daughter born here in 1915 and a son with his wife Lillian Elizabeth Tennant called Simon, born 1923 in Wallingford who died only in 2005. Simon did not get on with his father according to various written sources. A search of the Internet will tell you perhaps more than you need to know about Simon, a colourful character. I also believe that Felix was in the USA for a time around 1910. In 2017 more details of why Felix’s medals were not allowed came to light. He signed up for the Auxiliaries (Black & Tans) in Ireland after the war and after only a few weeks there was involved in the looting of a shop belonging to a Loyalist. He was sentenced to 12 months Hard Labour and removed from the Wiltshires lists as an officer. One of his brothers, Arthur Simon, was killed in 1917 serving in the London Regiment. His parents are shown as living in Jamaica at that time although I suspect it may have been one of a few homes they owned. In 1928 Felix had taken to flying with the Hampshire Flying Club and had just completed one solo landing in May of that year. He passed away in 1972 in Kent. Private Edwin (James) Terry – A married Carter by profession Edwin lived at Sheencroft farm. His wife was Annie Stravens, they had been married since 19th September 1896 and had four children. Three of these Margaret Annie (1900)John Edwin (1902) and Dorothy Mable (1905) were born in Clifton Hampden whilst the fourth Eric Gordon Arthur was born here in Blewbury in 1913 giving us some clue as to their arrival date in the village. His service record is quite specific too. He was originally posted to the 9th Battalion Royal Berks as number 18419, then to the 37th training company as 16259 before making the 2nd/1st East Kent Yeomanry as number 240616. Twice during his training at Bovington camp he had been late returning after a weekend pass, probably missed the train from Upton, and on 7th December 1917 he was serving in Reading. He was never posted abroad and on 1st June 1918 was posted to an agricultural company. He was 42 years of age by now and he underwent a special examination at Didcot on 27th July 1918 when he was designated fitness level B2 and unfit for service overseas anyway. He had to wait until 19th march 1919 though before he was demobbed back to Sheencroft. Private Maurice Walters – Born to John & Sofia in 1879, Maurice married Nellie Jeffries in 1904. In 1911 they were living in London Road and his medal card shows him as landing in France on 26th May 1915 as number 16554 with the Royal Berkshire Regiment. This would have been with the 2/4th Battalion who left Parkhouse Camp, Salisbury the previous day and entrained at Tidworth for the south coast and a boat to France. Private Hedley Walters – Born in the village at the end of 1885. 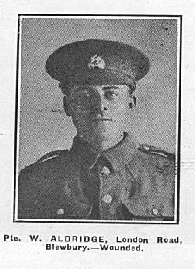 L/Cpl Edwin (Arthur) Webb – Arthur's two brothers were both killed during the war. He was Blewbury born in 1888 and was shipped home from India with the Royal Berks to be sent to France on 6th November 1914. He had originally enlisted on 11th December 1905, number 8099, in Dublin (probably due to the fact the Royal Berks were stationed there and he wanted to enlist in the same Battalion as his bothers) being 5ft 4 3/4 inches tall and having a 32 inch chest before expansion. He served right through until 14th September 1917 before being granted any leave and then a miserly ten days, having seen both his brothers killed a year previous on the first day of the battle of the Somme. The evidence points to the fact that he too was involved in the attacks on the same day and obviously things must have affected him as he was then given compassionate leave on 15th March 1918 for six months from the 2nd Battalion. Quite how he managed that is in the realms of speculation. Although Shell Shock was recognised at this point men were usually admitted to hospital to recover, to be granted six months leave is very unusual. In September 1918 he was stationed in Dublin but clearly not well as he was admitted to hospital before finally being discharged from the 3rd Battalion RBR on 8th April 1919. He submitted a claim for a pension having written that he had contracted Malaria in India between 1912 and 1913. This was rejected. On returning to this land fit for Heroes as was claimed then perhaps Arthur did not feel this was the case and he emigrated to Canada with his family and Parents in late 1919. Aubrey F Webb – Thanks to a distinctive name then Aubrey’s census records were easy to locate and you would think so would be the case for his military service. There were a number of Webb’s in the village for many years at the turn of the century and distinguishing each is not an easy task. Aubrey was born here in late 1893, the son of Frank and Hannah, and I have been not been able to distinguish between two men whose military records could be his. He either served in the 15th Hussars as number 10780 or in the RFA as number 1091. James Winter – I can identify James as the son of Elijah William and Mary Anne, born in Upton in 1882 and still there in 1901. In 1911 I cannot see any definite proof of him living in the village and the Mabel Winter-More living here in later years may not even be related to him. All of this has left me in difficulty trying to identify his military record. Pvt Henry Yates – I believe this to be Henry Victor Yates and another nephew of Pheobe Yates. He was born in Brightwell in 1897 and he enlisted in Wallingford on 21st December 1914 giving his age as 19 years and 5 months ( not true of course). He was a Gardener living at the Swan in Brightwell. His number was 57771 into the Royal Field Artillery under a short service or duration of the war attestation. His father is shown as Charles William Yates. Henry was 5ft 10 inches and weighed 10 ½ stone, tall for the time, and had a slight defect of the left elbow. He was then discharged only 19 days later as being not likely to make a soldier after a surgeon examined his left elbow describing is as severely deformed as a result of a fracture. Then under the Military service act he was called up on June 24th 1918, aged 20 years and 11 months when he put his profession as labourer. I suspect this was his true age. He joined as number 366225 and his service record exists and on it he lists his next of kin as his mother Esther. He had not grown at all according to the papers, they are quite feint in places. This time he is taken on into the Royal Engineers and sent to the Tyne Electrical Engineering Department as his posting officer describes him as `An intelligent Man, Standard 5 No. Knowledge of Electrical or Mechanism. I recommend posting to RE AA EE. They keep him until mid January 1919 when he is serving with No.16 AA RE coy and then send him home. His signature exists in many places, clearly on his kit form when he returned it at Hornchurch. Perhaps all of this did him good because in 1920 a Harry Yates is listed as the Barleymow Landlord. Pheobe, by all accounts, was a forceful lady and I am sure if she wanted a nephew of hers shown on the memorial then he would have been. Pvt Albin Yates - In 1911 Albin was living here with his Aunt Pheobe and cousin Charles (above). He was born here in 1883 but in 1901 is shown as working as a labourer in Sydmonton in Hampshire and on both the 1891 and 1901 census appears as Albin V. He was christened in Blewbury as Albert Vernon Yates and there is a medal card for a man of this name surviving, there is no Albin Yates though. He enlisted with the Royal Berks as 17853 and was wounded as he is shown as receiving a SWB and also a discharge as a consequence. He passed away in 1943.